As a Senate candidate I am a strong supporter of healthcare reform. I am still waiting for a public option or single payer system like other developed nations. I know why healthcare costs increased at double digit rates in America and eventually almost all our factory jobs and living wages for families were lost. Hey, I do this for a living. I know what I am talking about. In 2002, I entered federal court to try and stop the monopolization responsible. A cartel was keeping my web based distribution marketplace MedicalSupplyChain.com out of the market through refusal to deal and boycott. Two tried and true monopolization strategies that are consequently the harshest penalized under the law"when there was Rule of Law in America. It was about healthcare supplies-roughly 1/3 of the total healthcare spending in the nation. When the defense attorney in an emergency injunction hearing mistook the case he had not even bothered to read, for a health insurance matter, I laughed out loud. In 2002 medical supplies were costing America 1.2 Trillion Dollars and two hospital group purchasing organizations ("GPOs") Novation LLC and Premier Purchasing Partners had multiyear anti-competitive contracts with almost all hospitals. By 2005, my litigation was identifying over 36 auto plants that would be closed because the monopolization driving up the costs of healthcare added so much to the sticker price of GM and Chrysler automobiles, that they could not even compete in their own home market. Don't get me started on how even Democratic Party judges are on a jihad against the Sherman Antitrust Act and the competition laws that made this country the industrial leader of the world. Today the total healthcare spending on hospital supplies is over 2 Trillion Dollars. Now your state cannot even afford the healthcare for its current employees. The pension funds for healthcare benefits during retirement are not there, even if your state officials are telling you they are. No one called me with any questions during the Congressional healthcare reform "debate." I was marginalized and even actively silenced by the US Department of Justice and the Federal Bureau of Investigation. The Western District Office of Missouri Office of the US Attorney interfered in my private civil litigation, even antitrust cases in state court for the purpose of preventing me from putting on evidence that artificial inflation by GPOs injured consumers in the national market for hospital supplies. I switched my focus to the home healthcare market where my technological advantage would allow me to efficiently ship single items to residential addresses, drastically reducing medical supply costs in a market the hospital monopolists could not serve. 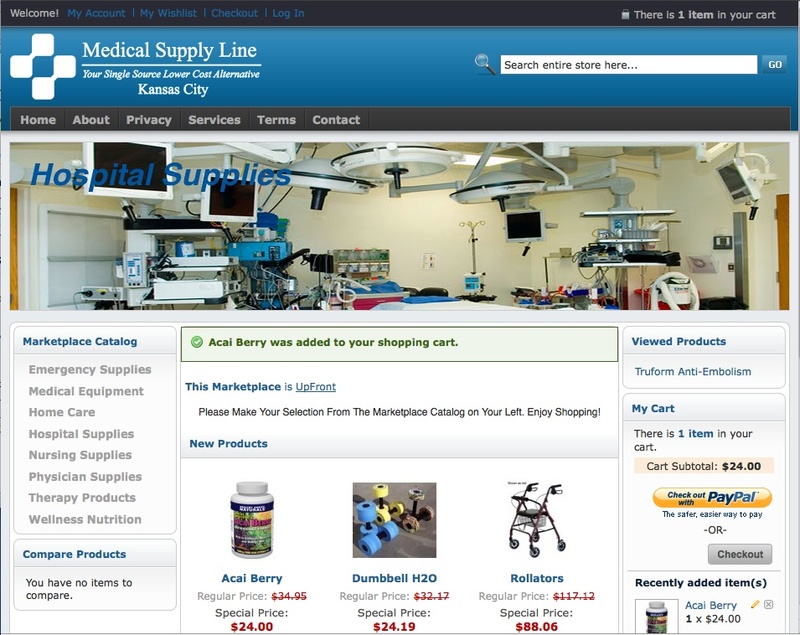 I used off-the-shelf components to build a working prototype of a web based open platform marketplace called MedicalSupplyLine.com, where I could approach manufacturers with allowing them to also bypass the GPO fees and price controls of the monopolists. I received a lot of interest and support for MedicalSupplyLine.com from medical device manufacturers, industry analysts and healthcare activists including actress Deidre Hall who sent an email agreeing to be the spokesperson. Deidre Hall, known for 29 years as Dr. Marlena Evans on NBC's "Days of our Lives," and in real life a long time advocate of expanding healthcare access to the poor and children, internationally and in her work with St. Jude's Children's Research Hospital. Deidre Hall, arguably the best recognized and trusted spokesperson in the home healthcare demographic, agreed to represent MedicalSupplyLine.com in television commercials similar to the work by celebrity spokesperson Wilford Brimley for Liberty Medical and William Shatner for Priceline.com. Liberty Medical, which sells in home diabetic supplies, was acquired by Medco (nyse: MHS) for 1.2 Billion Dollars in 2007, largely due to Brimley's role in building the brand. This was too much for the Western District of Missouri Office of the US Attorney who arguably saw their role as protecting the hospital supply cartel that included General Electric and its CEO Jeffry Immelt, the founder of GHX in partnership with Novation LLC. In a single day, laws were broken to take my downtown office, my town home home office and business car by law firms appearing to be sending me a clear message, days after my life was threatened by a senior Field Agent in the Kansas City, Missouri Office Kansas City, Missouri Office of the Federal Bureau of Investigation of the Federal Bureau of Investigation for asking who their records custodian for Freedom of Information Act requests was. I had to again turn to courts where Democratic Judges chosen by Democratic Party elected officials continue to gut laws that place a check on the power of large corporations. Like the Sherman Antitrust Act, no one can seem to state a claim under RICO the Racketeer Influenced and Corrupt Organizations Act. Democratic Judges sit there with evidence of felonies being committed even felonies to obstruct justice in their own court and under the new corporatist theory of government, seem to see their role as further injuring the victim. However the misconduct of the Kansas City Missouri US Attorney's Office of Beth Phillips in aiding and directing the racketeers to interfere in my civil litigation has been under investigation by the US Department of Justice Office of Professional Responsibility for the last year. The corporate sponsors of the healthcare reform we were steered toward knew they wanted healthcare insurance companies to be empowered by the outcome. Healthcare insurance companies were in effect given a $70 Billion Dollar subsidy (the reason for the mandated purchase of healthcare insurance). The trouble was health insurance companies were neither the problem or the solution. The have the same nation destroying incentive under the current healthcare reform act that they had before. They take a percentage of the artificially inflated healthcare costs in "administrative fees.". The sun is always shining for insurance companies. The Billion Dollars in K Street lobbying to get $70 Billion Dollars in subsidies and guarantee the continued existence of their gold plated parasitic franchise was a sound investment in their future, free of even government competition in the form of a public option. Healthcare is not insurance and it is not even "administration". The hospitals themselves play this game. Look around in your city. Chances are more than 80% that your "nonprofit" hospital has the biggest income stream of any enterprise you can name. Novation LLC and Premier Purchasing Partners owe their success to rebates or kickbacks to hospital administrators. Until recently the business model was bill Medicare and Medicaid the list price and later get the kickbacks as income, not refunds to Medicare. Since my litigation started, some of the more obvious antitrust crimes have stopped. Novation LLC and Premier Purchasing Partners don't fund some organizations that existed to give consulting contracts to hospital administrators to educate them on purchasing though only Novation LLC and Premier Purchasing Partners. However the amount of the kickbacks and related "management fees" (I know about these fees because I invented many legitimate precompetitive fees when I provided information technology for the precursor GPOs that were later acquired by Novation LLC and Premier Purchasing Partners) exceed Medicare's antikickback statute and are usually criminal. Early in the Obama presidency the House and Senate worked together and passed new enforcement tools including extending the False Claims Act statute of limitations to ten years but the US Department of Justice under Attorney General Eric H. Holder, Jr. still will not go near Novation LLC and Premier Purchasing Partners. As an independent Democrat, I disagree with the healthcare reform we got. I look to the principles of our party in advocacy for Organized Labor, Civil Rights, Environmentalism, Social Security, and Medicare. We value a civil society that limits the power of corporations even when they use agencies of government to discriminate or oppress citizens for illegal economic profits. I never thought our party should compete with Republicans in a contest to best represent the interests of investment banks and insurance companies. The current Republican Party majority in Congress means we will all have to look to rebuilding our civil society and trying to repair our social safety net without new progressive legislation from the federal government. I think real free markets with competition can deliver supplies to states and employers that are affordable and support sustainable budgets for meeting the needs of employees and retirees. I am being kept from the resources to participate in that but I can at least do my part and launch MedicalSupplyLine.com and start providing that competition wherever the subsidized job killing cartel corporations have not excluded or prevented serving customers. There will be no television commercials or nationwide advertising with a recognized and trusted spokesperson to quickly build volume and outlets for manufacturers that are excluded from GPO single source contracts. But word of mouth and good service will build a marketplace that over time will grow into the need that insurance company declining coverage, baby boomer retirees, the nation's rising underemployed and uninsured are creating. I will still be here when America throws off Corporatism and returns to valuing civil society and the Rule of Law.